THIS national award winning actor is no stranger to television, having judged six reality shows earlier. 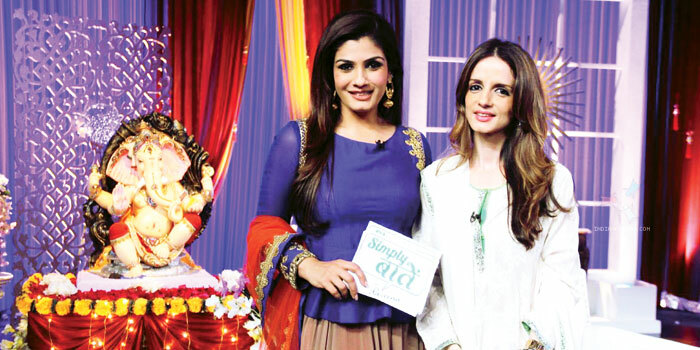 As Raveena Tandon chats with female achievers from different fields on her latest women-centric show, Simply Baatein with Raveena, on Sony Pal, she is simultaneously working on two films, Bombay Velvet and Shab, slated to release later this year. We caught up with her just before she set off to Sri Lanka on a family vacation. Ia��m a feminist and I really believe that we are all born equal. The show is focused on inspiring women not just in cities but in rural India as well along with some daredevil women. And we do not talk only to victims, we offer solutions as well, which is what really intrigued me about this concept. We had a Kashmiri woman on our show called Shahida who is the top cop in Srinagar today. She has single handedly killed 47 terrorists till date! Another lady was a truck driver. Her husband, who had a transport business died. Her in-laws threw her out, her husbanda��s brothers tried to steal his business, matters went to court and she didna��t have even `100 to feed her children. So she started driving a truck to earn money. Her story is just incredible. When Ia��m interviewing a stranger, there is the surprise factor involved. But in general, Ia��m a spontaneous person. Even in my entire film career, my best shot was either the first or second. For the show, I was never given any time with the guests. We were shooting three episodes a day. In just five days, Ia��d finished the whole season. Not many would know that I had adopted two girls when I was 21. My older one has a year-and-a-half baby now and he is a complete joy! So with kids and now a grandchild, Ia��ve become much more compassionate and my tolerance has reached another level. In Bombay Velvet Ia��m doing a cameo. Ia��ve known Anurag (Kashyap) and the producer Madhu Mantena for the longest time. Ia��d done Shool with Anurag. And they wanted me to be part of the movie. The music of Bombay Velvet is entirely jazz, which Ia��ve never done. Ia��m doing two songs in the film. The other film I am working on is Shab. It is an intense love story between three people. Ia��m playing an unhappy married woman who gets involved with another man but finally goes back to her marriage. 9 pm on Sony Pal.